Meet Arunachalam Muruganantham, India’s Menstruation Man – the one who made it affordable and accessible for every Indian woman to use a sanitary napkin. Recognized amongst the TIME Magazine’s 100 Most Influential People in The World for 2014, along with the likes of Narendra Modi and Barack Obama, Arunachalam is a modern revolutionary in the best sense. He is all over the news for his contribution to women’s hygiene and his success story isn’t only his own. It is helping millions of women carry on with their lives with better sanitation levels and greater dignity. Like all great feats, Arunachalam’s wasn’t an easy one either. He had to struggle with stereotypes, pressure from his family and social prejudices galore. After all, he was a man trying to make a difference in the world of women! Given the issue he was dealing with, even his most sincere initiatives were labelled as perverted and obscene. Yet, he did not give up and worked relentlessly for a cause that he knew was worthy fighting for. Here’s a look at how deplorable the condition of women’s hygiene in India was – before Arunachalam decided to step in. According to a survey by AC Neilsen , one out of five girls in India drop out of school due to menstruation and around 300 million women do not have access to sanitary napkins. Around 75% of the rural female population is still using unsterilized cloth, sand, and ash as substitutes to sanitary pads due to a lack of awareness on menstrual hygiene. 23% of adolescent girls in India are forced to discontinue studies due to inadequate public sanitary facilities. According to a recent article in The Times of India, out of 355 million Indian women of menstruating age, only 12% have access to sanitary napkins. This figure itself is emblematic of the gross neglect doled out to female hygiene. people like Arunachalam, sanitary pads were beyond the reach of the rural public. Most of the women from poor sections of rural society considered sanitary pads as a luxury and refused to spend money on it. They argued that buying a pack of pads would mean letting go of basic everyday needs like food and milk and chose to live in unsanitary conditions instead. This, according to Arunachalam was an atrocious state of affairs as the raw materials required to manufacture a sanitary pad weren’t really that expensive. The premium pricing was a result of the packaging and branding by big companies. He, therefore, made his own version of the sanitary pad at a fraction of the cost. 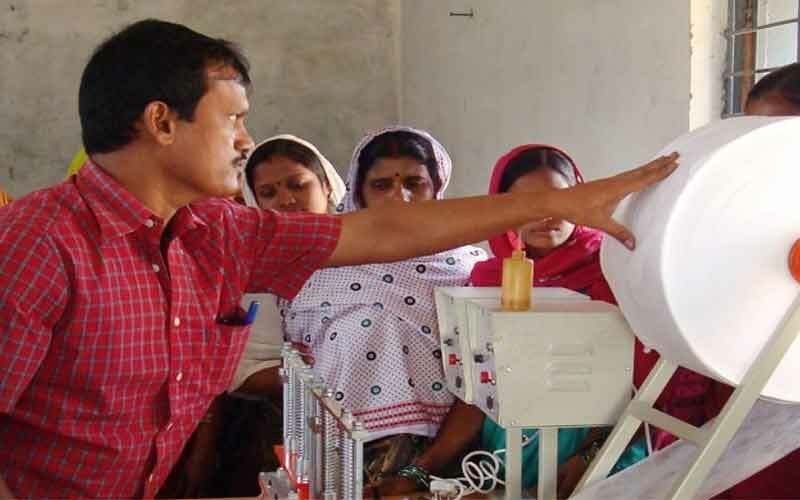 His efforts have resulted in the setting up of 1,300 machines across 27 states and 7 other countries – thanks to his relentless efforts, rural women in India and elsewhere too can now afford sanitary hygiene. In India, most of the products and goods are produced and sold for the middle and high income groups. Consequently, even many essential commodities stay out of reach for a majority of the rural population. Arunachalam, has, therefore refused to commercialize his product and is only giving it for the use of rural women. This way he has ensured both employment and better sanitary hygiene to the lower strata of society. It is high time that Indians stop looking at menstruation as a taboo subject and as something dirty. It’s a normal biological process that makes procreation possible. Besides making conversations about it acceptable, there is a pressing need to educate women about their personal hygiene during their menstrual periods. Women must be encouraged to come forward and share their views and opinions on subjects relating to personal hygiene without having to face ridicule. What Arunachalam did for Indian women was truly remarkable and here’s hoping that his efforts at breaking stereotypes and empowering women are taken forward across the country, and outside. Now hear the woman deliver this TED Talk. He makes an interesting point when he speaks of jealousy towards India’s many holy men: “These gurus get tons of women volunteers, but I didn’t get even one, though I was working for their benefits.” So exasperated was Arunachalam with the situation that he finally decided to try out one himself – thus becoming the first man in the world to wear a sanitary napkin!